Gosh, this is so GOOD. Possibly the best EP out of the four despite the fact that the fourth have yet to be unleashed. 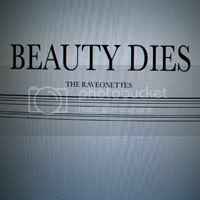 The third in the series is called Beauty Dies and all four songs are just delicious. Good job guys, keep ‘em coming… In other news, it appears that Nickel Eye as in Nikolai Fraiture of the Strokes, will be supporting the pair during their tour in January. The band seems to be contemplating on whether to add a bass player, and while I may not be an expert in these sorts of things, but for temporary purposes, there’s absolutely no need to look any further; in case you haven’t noticed, that’s a pretty terrific bass player you’ve got touring with you.